My article and pictures on diving in the Scottish highlands is published. In April I travelled to the Scottish Highlands. to dive Loch Leven, Loch Linnhe, Loch Creran and the River Etive. I was commissioned by Dive magazine to write an article and supply photos from the area. The article is called 'Taking the High Road' and if interested you can check it out in the September 2010 issue. 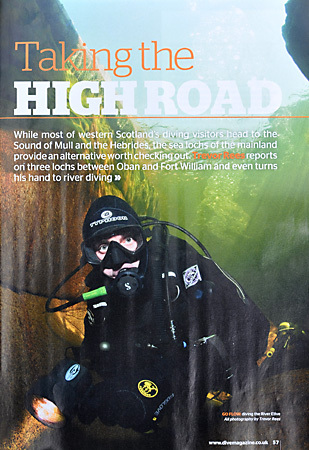 This photo, taken in the River Etive near Glencoe and heads up the article, with diver Charles Erb.